Amid the adrenaline rush and dreams of glory in sports arenas large and small this fall, there will be some hard knocks as well, leading to difficult, on-the-spot decisions. Athletes, coaches, doctors and parents will be called upon to determine as quickly and accurately as possible whether a player should sit out after taking a blow to the head. These choices can have life-long consequences. "As members of a team, players feel an obligation to contribute and so they sometimes push themselves more than they should, jumping back into the game before their brains are ready. Parents hoping for sports scholarships and coaches seeking wins don't always push back," notes Tara Alvarez, director of NJIT's Vision and Neural Engineering Laboratory who studies the visual symptoms of concussion. She adds, "The challenge for clinicians is deciding when athletes are ready to return to school and to play, especially as a fraction do not fully recover in the near-term, but develop post-concussive syndrome. Diagnosing it is ad hoc and imprecise at best." Alvarez and collaborators at NJIT and pediatric facilities around the country are developing and testing instruments to detect and treat one of the primary symptoms of concussion, an eye motor disorder known as convergence insufficiency (CI), in which the muscles that control eye movements do not coordinate to focus on near objects. Because each eye sees images separately, the person experiences double and blurred vision, headaches and difficulty concentrating. The impact on cognition and learning can be severe, particularly in children. "The visual neural circuit composes a lot of space in the brain, and is thus easily damaged by a concussion," she explains. "In terms of cognitive load, if someone is expending significantly more energy acquiring visual information, then less energy is available for thinking." Her diagnostic machine integrates two devices — a functional near-infrared spectroscopy (fNIRS) imaging machine and a video-based eye-tracking system — that together detect how changes in brain activity following an injury, including a mild concussion, correspond with changes in eye movements. Strapped to the head, the fNIRS machine uses light beams to measure blood oxygen levels — indicators of neural activity — in different regions of the brain. 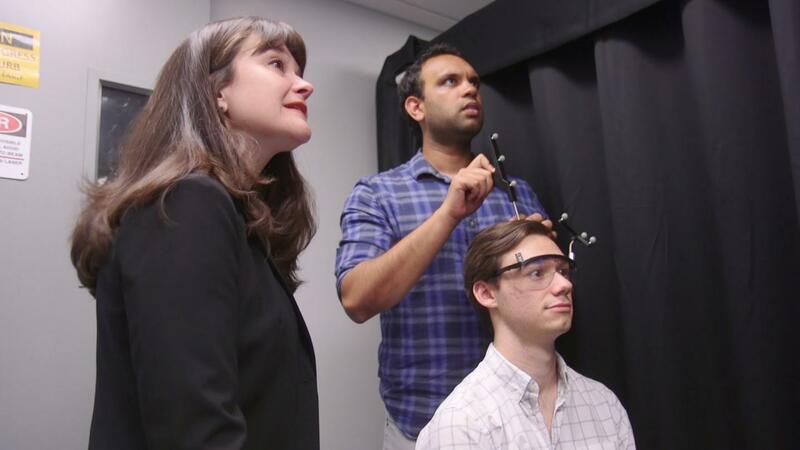 An ocular device Alvarez has created, known as a Vision and Neural Assessment Equipment system, measures eye movements and accommodation — the ability to see images clearly, which are promising biomarkers for neurological functions such as visual attention and memory. The goal is to create a portable medical device that can be carried to sports arenas to measure the severity of a brain injury on the spot, helping the coach and team doctor determine whether an athlete is at risk if sent back into the game. Repeated injuries exacerbate neurological problems down the road. Chang Yaramothu, a Ph.D. student in biomedical engineering in Alvarez's lab, spent last year testing the device on NJIT athletes on the Highlander soccer, basketball and lacrosse teams, conducting base tests at the beginning of the season and then studying students who suffered concussions at regular intervals to document the healing process. He will begin testing Rutgers University-Newark athletes this year. "Students want to know how injured they are, but the concussion diagnosis field is very subjective. There are some tests, but to date, decisions often hinge on answers to basic questions like, 'How do you feel? Do you have a headache? Are you nauseated?'" Yaramothu notes. "I'm hoping that the binocular health index I'm developing, which is a quantitative assessment based on eye movements, will enable physicians and trainers to make a diagnosis on the spot." "Two of the things I've learned are that concussions are not the same and that there is no one timeframe for recovery," he adds. Xiaobo Li, an associate professor of biomedical engineering who specializes in attention function, is also working with Alvarez on brain imaging and clinical assessments. "Attention deficits are the most common long-term consequences of concussion, especially in children," she says. Meanwhile, Alvarez has also embarked recently on a pilot demonstration of a device to remediate the symptoms of CI, which incorporates virtual reality games invented and designed by NJIT students, at The Children's Hospital of Philadelphia (CHOP). She and collaborators from several other institutions are studying children between the ages of 11 and 17 with CI. Christina Master, M.D., a pediatrician and pediatric sports medicine doctor at CHOP who specializes in concussions, will oversee it. Master says she's eager to better understand the disorder and determine whether a home-based device can treat it. "Many kids don't recognize they have a visual problem. After a concussion, for example, they have difficulty describing the symptoms with any specificity. Sometimes they'll just say, 'I don't feel well. I don't like reading. I get tired,' " she notes. "We had a hunch about what was going on, but we couldn't quite put our finger on it. Assessments for CI are not routinely done. Often, kids would see an optometrists and ophthalmologist and be told they're normal. Given a specific questionnaire screening for CI, however, they are better able to pinpoint details like trouble reading and skipping lines." Over the next several months, Alvarez is expanding the study to four other children's hospitals, including the University of Alabama, Birmingham (UAB). An epicenter of football culture, the university is a major hub for head injury and helmet research. "Helmets still only protect the skull, not the brain," she notes. "Part of what UAB studies is younger children in Pop Warner football, because their injuries are worse than those in the NFL. Kids don't know how to brace." Bharat Biswal, distinguished professor of biomedical engineering who is a pioneer in brain imaging, is an integral participant in the concussion studies. With the backing of a National Science Foundation I-Corps grant, among others, John Vito d'Antonio-Bertagnolli, an associate researcher in Alvarez's lab who earned undergraduate and master's degrees at NJIT, devised a novel integration of consumer-ready virtual reality headsets and custom-made eye-tracking hardware and software to aid patients in vision therapy. To design games to rehabilitate children with concussion, Alvarez is working with Eric Nersesian, director of the virtual reality lab at NJIT's Ying Wu College of Computing, as well as Jessica Ross, a concept artist and adjunct faculty member at NJIT's College of Architecture and Design. Bryan Pfister, chairman of the biomedical engineering department at NJIT, is devising a variety of tests to better gauge the effects of blunt and blast injuries on the brain using sensors that record how the brain moves upon impact. While researchers have documented skull injuries extensively, they know much less about the brain itself, and especially mild traumatic brain injury (TBI), which occurs most often in sports games.